The term 'flow' refers to experiences where the musician moves into a consciousness in which time seems to be suspended and perception of reality is blurred by unconscious forces. 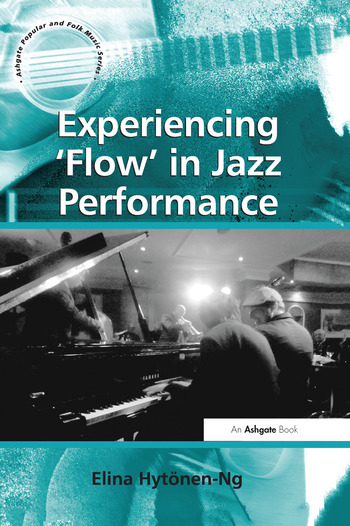 An essential part of the jazz tradition, which often serves as the foundation of the musician's identity, flow is recognised within the greater jazz community as a critical factor in accomplished musicianship. Flow as a concept is so deeply embedded in the scene that these experiences are not generally discussed. It contributes to the musicians' work motivation, providing a vital level of satisfaction and accomplishment. The power of the experience, consciously or unconsciously, has given rise to the creation of heroic images, in which jazz musicians are seen as being bold, yet vulnerable, strong and masculine, but still capable of expressing emotions. In this discourse, musicians are pictured as people constantly putting themselves on the line, exposing themselves and their hearts to one another as well as to the audience. Heroic profiles are richly constructed within the jazz scene, and their incorporation into narratives of flow suggests that such images are inseparable from jazz. It is thus unclear how far the musicians are simply reporting personal experience as opposed to unconsciously perpetuating a profoundly internalised mythology. Drawing on eighteen interviews conducted with professional jazz musicians from around the world, Elina HytÃ¶nen-Ng examines the fundamentals of the phenomenon of flow in jazz that has led to this genre's popularity. Furthermore, she draws on how flow experiences are viewed and constructed by jazz musicians, the meanings they attach to it, and the quality of music that it inspires. Contents: Foreword; Preface; Introduction: Unravelling flow experiences; ’Like a junkie looking for musical fixes’: positive feelings and motivation formation in flow; ’Purely for the love of music’: emotionalism in discussions of flow; ’Always concentrating on the music’: highlighting professionalism; ’Profound merging with people’: enhanced collectivity within the band; ’The whole mystery of being human’: spirituality and flow; ’Unreserved approval’: the importance of an audience; ’Smallish, intimate places’: optimal performance venues; Contextual things; Wider perspectives on flow and altered states of consciousness; Bibliography; Index. Elina HytÃ¶nen-Ng is a cultural researcher and an ethnomusicologist working at the University of Eastern Finland. Her current interest is in the contemporary British jazz scene. She has been an academic visitor at the Faculty of Music, University of Oxford and a visiting research fellow at King's College, London.